Those who decide to remodel their bathroom or kitchen face the perpetual question: which tiles to go for - ceramic or linoleum? Of course, there are other options as well but these two appear to be the most popular among US homeowners. Eeven though the first thing that might pop to mind when you think about linoleum are hospitals and schools, there is a whole new generation of this material that brings plenty of benefits along and competes well with ceramic. Here are the advantages and shortfalls of these two which will hopefully help you make the right choice for your needs. Versatile and easily maintained, ceramic tiles are a great architectural resource that have more applications than we could possibly count. In a standard kitchen, some of the common places where ceramic tiles are used are walls and backslashes. However, we often see people use them for decorative purposes, too. They're great because they're easy to clean and don't absorb dirt and germs. Also, ceramic tiles are quite sturdy and versatile; however, we wouldn't recommend them for floors. This is where porcelain tiles should work better. They're sturdier and are more easily repaired, basically the most important features ceramic tiles are lacking. Linoleum, on the other hand, is very desirable because of its clean-up factors. If you've got kids who tend to spill a lot of stuff on the floor, you'll be very appreciative of this. 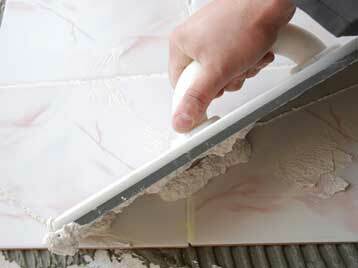 Sweeping this material is easy and the surfaces tend to be smooth. Besides, linoleum doesn't crack as often, leaving the floor susceptible to dirt and debris which find their way into the cracks. However, you may be missing the luxurious touch that tiles give and the vast choice of patterns and finishes. Still, as a cheaper and more practical alternative, we can see why linoleum wins the hearts of many! Regardless of the material you choose to use in your bathroom or kitchen, rest assured our professionals at Drywall Repair & Remodeling Calabasas, CA are highly skilled in performing a variety of installation services.